Salford 10k Team win Business Trophy for second year running! 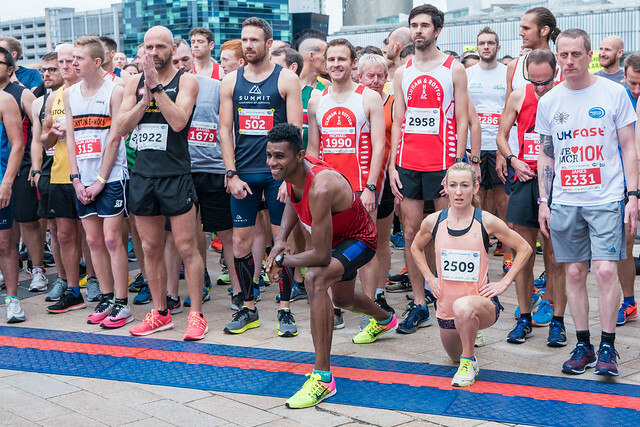 On Sunday 9 September the University of Salford 10k team were out in force to represent the University in a wave of red branded t-shirts at the UKFast City of Salford 10k. This is the second year that we have entered a team, following last years’ success when a team of 50 runners entered as part of the University’s 50th year anniversary celebrations. This year a team of over 50 students and staff from across the University took part in the event, bringing home the Business Trophy for the second year running! The Business Trophy is awarded to the business team with the fastest time, based on their top three runners’ results. Working closely with the race organisers, Sports Tours International, we also provided our MCUK campus as the area for all runners to leave their bags, with over 1000 people passing through our University grounds. The Marketing team wasted no time advertising their sports injury clinics, as well as forthcoming Open Days, on the digital screens to those passing by.